With her “humor meets tell-it-like-it-is” insights and real-life examples, entrepreneur, business coach and author Stephanie Bogan will share her journey from home office start-up to the sale of her firm to a Fortune 200 company along with the powerful lessons she has learned along the way. •What you can do to meet the demands of increasing costs, complexity and competition. 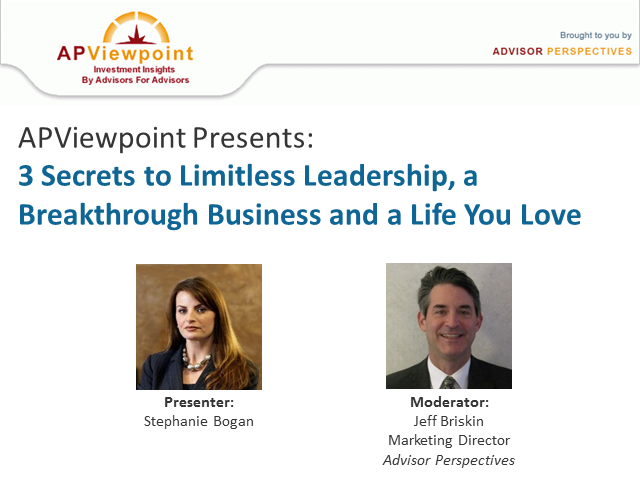 Stephanie will answer attendees’ questions during the webinar and will be available to continue the discussion on APViewpoint. Replay eligible for one CFP Board® and IMCA® CE credit. • What investors should consider when building fixed income portfolios to navigate this uncharted environment. Matt will answer attendees’ questions during the session and will be available to continue the discussion on APViewpoint. The CFP Board® has accepted this program for one hour of CE credit towards the CFP® certification. In addition, IMCA® has accepted this program for one hour of CE credit towards the CIMA®, CIMC® and CPWA® certifications. If you provide the required information during the webinar registration process and stay for the entire session we can report your attendance to these organizations. The fastest growing advisory firms have figured out a formula for transformational growth. How are the leaders of those firms growing 31% faster than every other advisory firm? Through 16 years of experience, research and consulting to over 600 advisory firms of all sizes, Angie Herbers shares this simple, fundamental method to transformation growth. Angie will answer attendees’ questions during the session and will be available to continue the discussion on APViewpoint. •How your role as a financial advisor will change — much sooner than you think. •Which game-changing innovations will require you to rethink your business. •How the blockchain will transform the way you manage client transactions. •Why career counseling, career planning and lifelong learning will be key services you’ll need to provide to your clients. •How the cyclical lifeline is replacing a linear lifeline. Ric will answer attendees’ questions during the session and will be available to continue the discussion on APViewpoint. The IMCA® has accepted this program for one hour of CE credit towards the CIMA®, CIMC® and CPWA® certifications. If you provide the required information during the webinar registration process and stay for the entire session please email us at cecredit@advisorperspectives.com for the IMCA ® webinar ID to self-report your attendance. Despite women’s rising economic power, many female clients face financial discrimination. The gender wage gap, the lack of funding for women entrepreneurs, and the “pink tax” levied on many products and services makes it challenging for these clients to accumulate wealth at the same rate as their male counterparts. Money silence just makes this bad situation worse. These women need savvy advisors to teach them “money talk” skills so they can stop paying such a high price for their gender. In this webinar presentation, Kathleen Burns Kingsbury explains why the cost of money silence is especially high for women and offers practical strategies advisors can use to empower these clients to negotiate more and pay less. All participants receive a bonus chapter, “Is Your Gender Costing You A Fortune?” from Breaking Money Silence: How To Shatter Money Taboos, Talk More Openly, and Live a Richer Life, to be published September 30, 2017. Kathleen will answer attendees’ questions during the session and will be available to continue the discussion on APViewpoint. Any financial expert willing to invest time and effort into developing and sharing their wisdom can become an online financial influencer in whatever niche suits you best. Since advisor podcasting happens online, it has many advantages versus showing up at a local broadcast studio or meeting at the stock exchange for an interview. Kirk will answer attendees’ questions during the session and will be available to continue the discussion on APViewpoint. •Should the decision to work with an advisor who adheres to the fiduciary standard or the suitability standard be left to investors, rather than the government? •Will the rule create administrative burdens and liability risks that will discourage advisors from serving retirement clients? •Will registered representatives moving from commission-based to fee-based compensation no longer be willing to take on clients with smaller pools of retirement assets? Knut and Tom will answer attendees’ questions during the session and will be available to continue the discussion on APViewpoint. The IMCA® has accepted this program for one hour of CE credit towards the CIMA®, CIMC® and CPWA® certifications. If you provide the required information during the webinar registration process and stay for the entire session please email us at apviewpoint@advisorperspectives.com for the IMCA ® webinar ID to self-report your attendance. Researchers often assume that retirees make decisions only at or just before retirement. But retirees and their financial advisors can dynamically adjust strategies over time. Doing so improves the likelihood of financial success in retirement. David will answer attendees’ questions during the session and will be available to continue the discussion on APViewpoint. The IMCA® has accepted this program for one hour of CE credit towards the CIMA®, CIMC® and CPWA® certifications. If you provide the required information during the webinar registration process and stay for the entire session, please email us for the IMCA ® webinar ID to self-report your attendance. • How time segmentation helps advisors deliver more customized, needs-based retirement-income planning solutions for their clients. The IMCA® has accepted this program for one hour of CE credit towards the CIMA®, CIMC® and CPWA® certifications. If you stay for the entire session please email us for the IMCA ® webinar ID to self-report your attendance. Many advisors run their business by the seat of their pants, always putting out fires rather than running their business in logical, proactive manner. In this presentation, Teresa will provide tools and advice for you and your team to develop a “master calendar” with specific weekly goals and action items. You will stay focused on your most important activities, minimize missed opportunities and keep from feeling overwhelmed by your ever-growing “to-do” list. •reduce the number of interruptions and distractions that keep you from achieving your priorities. Teresa will answer attendees’ questions during the webinar and will be available to continue the discussion on APViewpoint. The replay is eligible for one IMCA® CE credit. •reduce their downside risk on a long-term basis without relinquishing ownership of their shares or capping their upside. Thomas, Nischal and Elizabeth will answer attendees’ questions during the webinar and will be available to continue the discussion on APViewpoint. •How the successful implementation of these policies will reduce debt and increase prosperity, benefiting both investors and advisors. Michael will answer attendees’ questions during the session and will be available to continue the discussion on APViewpoint. Proposed legislative rollbacks and Trump administration proposals on corporate governance and climate change have raised concerns about their potential impact on environmental, social, and governance (ESG) investing. · The ramifications of the potential withdrawal of U.S. involvement in the Paris Agreement on Climate Change. Abdur will also discuss the outlook, opportunities, and risks for ESG investors and new analytic tools for identifying ESG investment candidates and explain why the overall outlook for ESG investors still remains promising. He will answer attendees’ questions during the webinar and will be available to continue the discussion on APViewpoint. •The threat posed by China's endemic pollution problems on the wellbeing of its people and its economy. Brian will answer attendees’ questions during the session and will be available to continue the discussion on APViewpoint. •Ways to connect with clients and centers of influence to effectively grow your business. Paul will answer attendees’ questions during the session and will be available to continue the discussion on APViewpoint. And all advisors who attend the webinar can receive a free copy of Paul’s white paper, Words that Work in the Real World: Four Scripts and Tips for Advisors to Create Compelling Conversations. Knut will answer attendees’ questions during the session and will be available to continue the discussion on APViewpoint. •Use body language and other non-verbal cues to defuse tense situations. Bev will answer attendees’ questions during the session and will be available to continue the discussion on APViewpoint. -How to overcome the top obstacles keeping clients from doing business with you. Mark and Kim will answer attendees’ questions during the session. •The potential benefits of a “time-period” inflation approach that utilizes targeted weightings of short, intermediate and long-term investments. Mark will answer attendees’ questions during the webinar and will be available to continue the discussion on APViewpoint. The IMCA® has accepted this program for one hour of CE credit towards the CIMA®, CIMC® and CPWA® certifications. If you provide the required information during the webinar registration process and stay for the entire session please email us for the IMCA ® webinar ID to self-report your attendance. •What will advisory firms and advisors need to do to survive and grow in the coming years? •Which kinds of fund companies are most likely to retain and grow assets? •Is Dimensional planning on offering its funds directly to retail investors or through robo-advisors? David will answer attendees’ questions during the webinar. The most successful advisors—those who are growing their business and revenue without sacrificing their quality of life—are able to focus on activities that help them achieve better health, higher energy and lower levels of stress. 1 exercise that will help you get started immediately. Julie will answer attendees’ questions during the webinar and will be available to continue the discussion on APViewpoint. Advisors who attend this webinar or view the replay will have a limited-time opportunity to buy Julie’s book, The Pursuit of Absolute Engagement, at a special discount price. This offer expires on Thursday, March 9, 2017. Details will be provided during the presentation. Advisor Perspectives is the leading interactive publisher for Registered Investment Advisors (RIAs), wealth managers, and financial advisors.